I read that these chips were one of the TOP TEN gluten-free favorites for consumers…. so I had to get some for the family to try out. 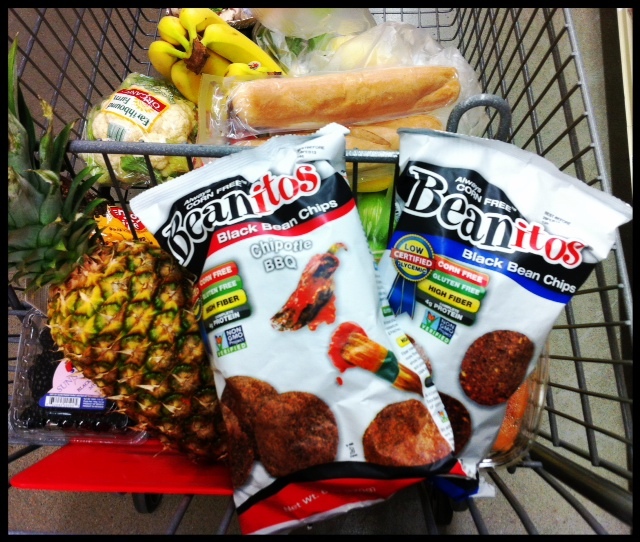 My husband said they’re perfect – the after-taste is refried beans… So if you like that flavor – these are worth a try!! I used to love stuffing. Yes, there are other ingredients in the traditional Thanksgiving dish.. but the holiday wouldn’t be the same (for me) without it… so I knew I had to get to work… because the 99 cent box of Stove Top, wasn’t an option this year. I’ve been on the hunt for the recipe that looked the most like the one I might enjoy. I ended up with a dish off of glutenfreecookingschool.com… with a few modifications. I started with a whole loaf of UDI’s GF bread… and cut the entire thing into 1/2 inch pieces – and toasted those pieces in the oven at 400 degrees for 10 minutes, turning every 2-3 minutes. IT was actually REALLY easy, but I’m sure with anything it can be easy to ruin too…. by not toasting the bread enough or putting too much broth in too quickly. Pour toasted bread into large bowl, melt the butter over medium high heat. Add the onions, celery and mushrooms and cook for 5 minutes. Stir in the parsley and spices and in toasted bread and toss until well combined. Stir in stock until the stuffing is lightly moist, and turn to low to soak in for 3 minutes. Stir again, and check consistency. Voila! 🙂 YUM! It was 10 thumbs up at this house and really painless over all… and now we KNOW what is in the stuffing we’re eating! Here’s to being healthy for HIM! Posted on November 14, 2012, in Celiac/Gluten Sensitivity, Food To Try and tagged beanito chips, casein free stuffing, celiac disease, Gluten free stuffing, gluten free thanksgiving, gluten intolerance, gluten sensitivity, healthy for him. Bookmark the permalink. 1 Comment. YAY!! Thanks for posting the recipe! Can’t wait to give it a whirl! Delicious!